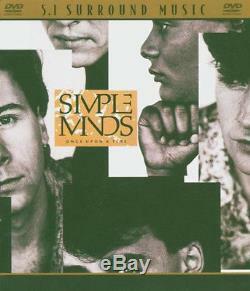 SIMPLE MINDS Once Upon A Time RARE OUT OF PRINT DVD-AUDIO 5.1 SURROUND SOUND DISC. Impossible to find this is just so fine. JIM KERR and band at their zenith. ITEM CONDITION: EXCELLENT CONDITION/lite wear on outside of case. FIRST CLASS also EXPEDITED/PRIORITY available. This DVD Audio/Video disc is absolutely stunning. I cannot tell any difference between something mixed in 5.1 today versus this Simple Minds'Once Upon A Time' 5.1 mix from 1985. It is truly a gem! The music is spacious, crystal clear, and crisp. The vocals and music soar all around. The discrete 5.1 DTS mix makes use of the center channel, which is where the majority of the lead vocals are heard. Background vocals are scattered throughout the channels. It's amazing hearing Jim Kerr's voice come through just one speaker. It really allows one to hear the true dynamics of the original studio recordings, and the quality production that accompanies throughout. I'm hearing pieces of music that I've never heard before in the original stereo recordings. JB Included on this DVD Audio/Video Disc: The original 8 tracks in both 5.1 Surround Sound (DVD-A 96/24 + DTS 96/24) and PCM 2.0 Stereo (48/16). 01 Once Upon A Time 02 All The Things She Said 03 Ghost Dancing 04 Alive And Kicking 05 Oh Jungleland 06 I Wish You Were Here 07 Sanctify Yourself 08 Come A Long Way Note that some songs are actually a few seconds longer than the original CD/vinyl versions. Bonus features include: Lyrics Videos - All The Things She Said + Alive And Kicking Discography Weblinks. FIND OUT MORE ON MY "ABOUT ME" PAGE. Don't Forget This Listing - Add Me to Your Favorite Sellers List. Condition of Item is found at the bottom of the description of the item above the Review and track info. For a more in-depth explanation of what these mean (ie: mint, if sealed or not) please visit my about me page. ABBREVIATIONS USED IN LISTING HEADINGS. OOP = OUT OF PRINT HTF = HARD TO FIND s/t = SAME TITLE JPN = JAPANESE IMP = IMPORT IMPORT INFORMATION: Any CD that says in the description "import" JAPANESE or otherwise is in ENGLISH as the regular Domestic ones are. The lyrics and artwork are all the same and in english. They are usually more desirable due to the superior mastering on a lot of them. REMASTERED INFORMATION: Any CD that says REMASTERED means that it is the original recordings but they have been REMASTERED. In other words they have usually taken the ORIGINAL LABEL MASTER TAPES and REMASTERED them into the digital format for FAR SUPERIOR SOUND QUALITY. A lot of the older CD's had been rushed released and they used poor quality reference masters. The newer Remasters not only benifit from the original first generation mix-down masters but the newer technology in equipment that is available recently has improved the sound quality dramatically. They are the original recordings. H D C D INFORMATION: This is a format in CD mastering that improves on sound quality and adds to the band width available. Any CD that says H D C D plays on any CD player but sounds even better on a player with H D C D compatibility. Good luck, hope you get what your looking for and thank you for considering my listing. This info will answer most questions you have. If there are other questions feel free to contact me. We are trying to deal with them the best we can. We add NEW ITEMS everyday to our listings. If you have ANY QUESTIONS please contact me for price quotes or explanations. The Finest Available in The Business. Digipak Cases have additional cardboard added to mailer to protect them. Just one of inkFrog's. The item "SIMPLE MINDS Once Upon A Time RARE OUT OF PRINT DVD-AUDIO 5.1 SURROUND SOUND" is in sale since Sunday, May 15, 2016. This item is in the category "Music\Other Formats". The seller is "micksmuse" and is located in San Diego, California. This item can be shipped to North, South, or Latin America, to all countries in Europe, to all countries in continental Asia, to Australia.